Are you constantly tensed, worried or experienced sudden and unexpected attacks ? Or Do you avoid everyday situations or activities ? Or Feeling like your mind has gone blank ? These are nothing but the symptoms of Anxiety Disorder. 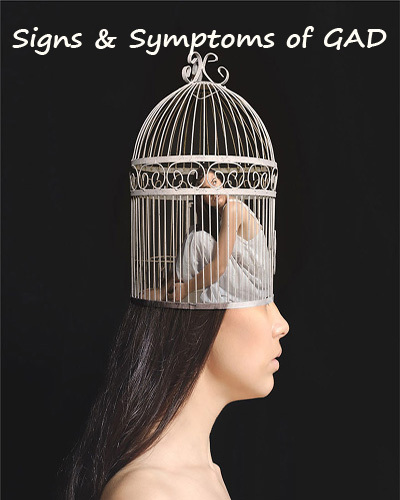 Anxiety is the body’s natural response to danger, like an automatic alarm that goes off when you feel scared, under pressure, or facing a stressful situation. 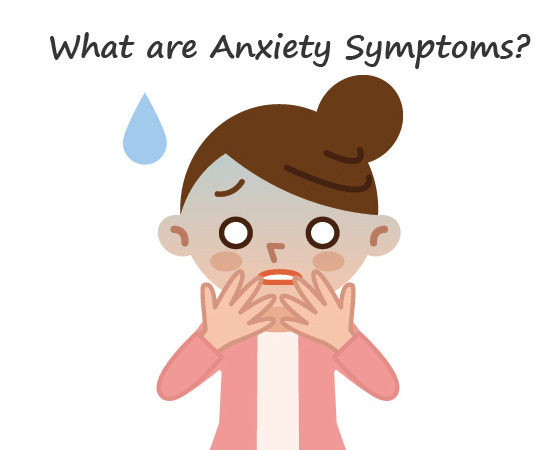 Hence, read the complete article to know the Anxiety Disorder symptoms. Living with Anxiety is being followed by a voice. It knows all your insecurities and uses them against you. Everyone feels anxious now and then. Because anxiety is a normal emotion. Most of us feel nervous when faced with a problem at work, while speaking with the public, before taking a test, during a job interview or making an important decision. Anxiety Disorder is a different condition. It differs from normal feelings of nervousness or anxiousness, and involve excessive fear or anxiety. Also, the symptoms of Anxiety may vary from person to person. One may suffer from severe anxiety attacks that strike without warning, while another gets panic at the thought of mingling at a party. Aniexty is mainly classified into six major types. Each of them is having different symptoms. But don’t worry! these anxiety disorders are treatable and a number of effective treatments are available. Remember the moment you started treating the anxiety disorder, you start feeling better. Hence, choosing the correct Anxiety Disorder Treatment helps most people to lead normal productive lives. Having a sense of impending danger, panic or doom. Having an increased heart rate. Trouble concentrating or thinking about anything other than the present worry. The Anxiety symptoms can be emotional or physical in nature. If you have an anxiety disorder, the emotional symptoms you may experience are ones that are related to feelings of fear. You may constantly feel like danger is near, and also feels like you have little control over your environment. Whereas the physical symptoms vary depending on which type of disorder you have. So, have a look at these emotional and physical symptoms. Feelings of apprehension or dread, watching for signs of danger, anticipating the worst. Feeling tense and jumpy, or irritable. Headaches, stomach upset, or dizziness. Muscle tension, tremors, and twitches. These are the common anxiety symptoms that you might experience. If you have experienced any of the above or other than these, consult your doctor and seek treatment. 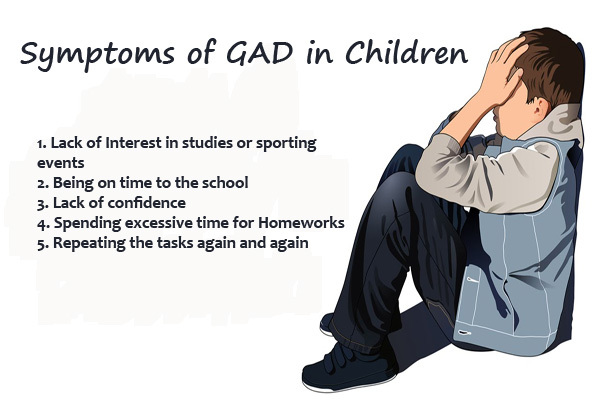 Generalized anxiety disorder or simply GAD is identified by excessive, exaggerated anxiety and worry about everyday life events with no obvious reasons for worry. People with generalized anxiety disorder symptoms tend to always expect disasters and stops worrying about their health, family, work, money, etc. 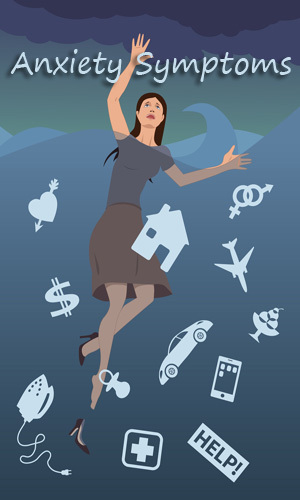 In people with GAD, the worry is often unrealistic or out of proportion for the situation. GAD is mentally and physically exhausting. It drains your energy, interferes with sleep, and wears your body out. Not everyone with this generalized anxiety disorder has the same symptoms, but most of the people will experience a combination of emotional, behavioral, and physical symptoms that often fluctuate, becoming worse at times of stress. Restlessness or feeling wound-up or on edge. Difficulty concentrating or having their minds go blank. Sleep problems (difficulty falling or staying asleep or restless unsatisfying sleep). A noticeably strong, fast or irregular heartbeat (palpitations). Difficulty falling or staying asleep (insomnia). Besides these physical symptoms, you may also experience some emotional symptoms such as Constant worries running through your head, inability to tolerate uncertainty, etc. People with GAD may also experience behavioral symptoms such as Difficulty concentrating or focusing on things, Impotence to relax, enjoying very less time, etc. It’s possible to develop generalized anxiety disorder as a child or a teenager or an adult. The symptoms of Generalized anxiety disorder seems like they are similar to that of panic disorder, obsessive-compulsive disorder and other types of anxiety, but the truth is that they are all different conditions. Performance at studies or sporting events. Being on time to the school (punctuality). Earthquakes, nuclear war or other catastrophic events. Feel overly anxious to fit in. How to become a perfectionist in everything. Repeating the tasks again and again until they are satisfied because they think that they are not perfect during the first time. Spending excessive time in doing their home works. Anxiety attacks, also known as panic attacks, are episodes of intense panic or fear. Anxiety attacks usually occur suddenly and without warning. These attacks usually peak within 10 minutes, and in a rare case only, it lasts more than 30 minutes. But during this short time, the terror can be so severe that you feel as if you are about to die or totally lose control. 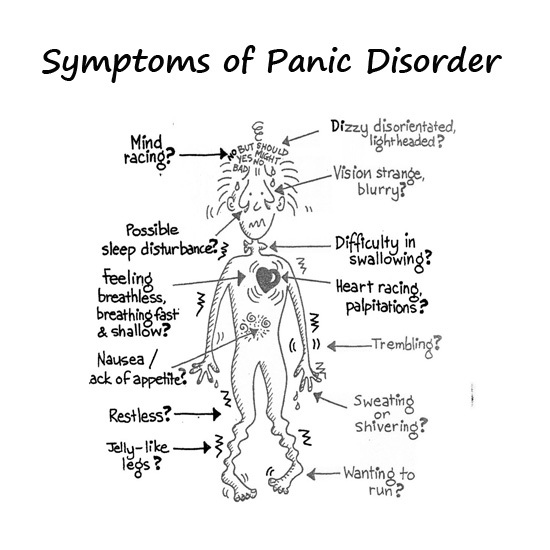 Hence the common Anxiety Disorder symptoms during an attack are listed below. Sudden and repeated attacks of intense fear. Feelings of being out of control during a panic attack. Intense worries about when the next attack will happen. Social anxiety disorder doesn’t always involve speaking to a crowd or being the center of attention. 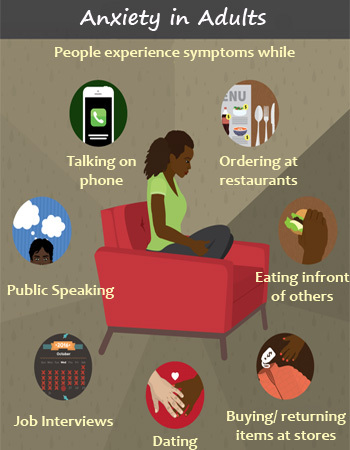 In most of the cases, anxiety is caused by everyday situations such as making one-on-one conversation at a party, or eating and drinking in front of even a small number of people. 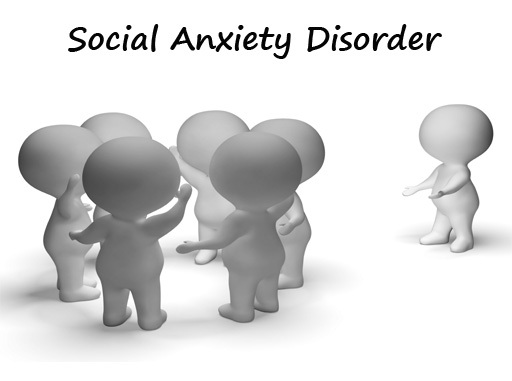 In all these situations, people with social anxiety disorder tend to feel like all eyes are on them. So, they experience difficulty in talking. Also, people with social anxiety disorder may experience an intense fear of being scrutinized and negatively evaluated by others in social or performance situations. Some people literally feel sick from fear in seemingly non-threatening situations. Feeling highly anxious about being with other people and having a hard time talking to them. Being very afraid that other people will judge them. Feeling very self-conscious in front of other people and worried about feeling ashamed, embarrassed, or rejected, or fearful of offending others. Staying away from crowded places. Blushing, sweating or twitching around other people. Worrying for days or weeks before an event where other people will be. Having a hard time making friends and keeping friends. Feeling nauseous or gastro problems or simply sick to your stomach when other people are around.